Although Americans are still conflicted on the abortion issue, the constitutional right appears firmly supported 40 years after the Supreme Court decision. Several new polls with different wording, but all conducted in January 2013, all show majorities and, in some cases, super majorities for not overturning the Roe v. Wade decision. Many constitutional scholars believe the core legal rationale is not well-embedded in constitutional doctrine or tradition and, hence, invites challenges. The Court has accepted state-sponsored restrictions to the abortion right (Planned Parenthood v. Casey, 1992) and federal restrictions related to partial-birth abortion (Gonzales v. Carhart, 2007). Most people will accept restrictions. Gallup reports more than half of Americans believe abortion should be illegal only under certain circumstances. Eighty percent believe abortion should be illegal in the last trimester. However, there are more pro-abortion activists (about 30% in polls) than anti-abortion activists (range from 9% to 18%). Nearly a majority of the public (47%) believe abortion is morally wrong. Hence, there is a level of moral discomfort that leads people to support reasonable sounding limitations. The issue does not command much public attention. Only 18 percent see abortion as a critical issue and only 44 percent of persons from 18 to 29 years old can identify that Roe v. Wade was about abortion (only 13% of younger voters saw it as a critical issue). Although they are more pro-choice than people 30 years old and older, they are not activated by the issue the way feminists were in the 1970s and 1980s. The issue is a problem for Republicans. Although Gallup reports 67 percent of Republicans call themselves pro-life, the party is divided 46 percent to 48 percent in favor of not overturning Roe v. Wade. Hence, a substantial percentage of party identifiers support restrictions, but not criminalizing the core right. 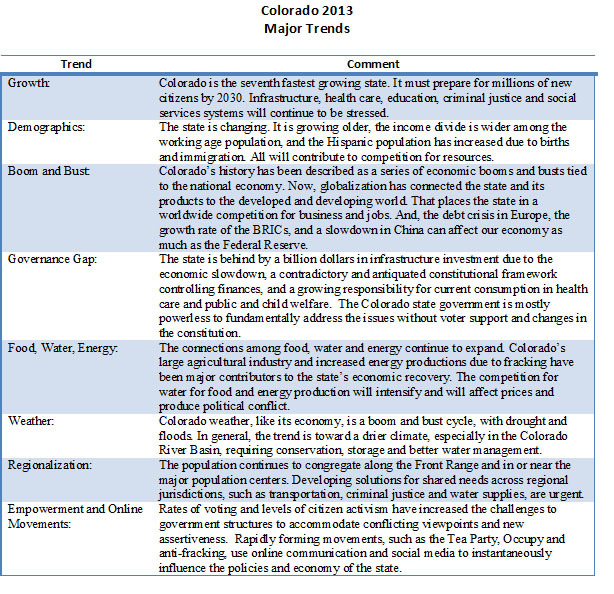 Colorado enters 2013 in a very good position, but the major trends influencing it will provide challenges. The state is in a steady, if slow, recovery, and is below the national average for unemployment. Housing sales and prices have increased and local and state tax revenue are growing from the uptick in sales and income. Colorado also continues to attract new residents. 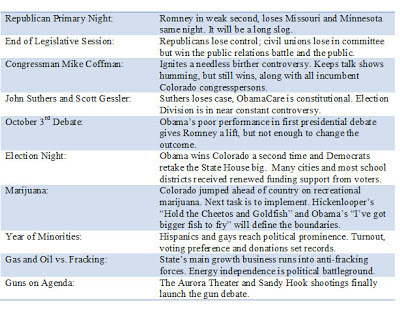 Colorado’s role as a battleground in the presidential election was a top news story, reinforcing the state’s reputation as a center of political involvement with a reasonably balanced, if sometimes unpredictable, political culture. 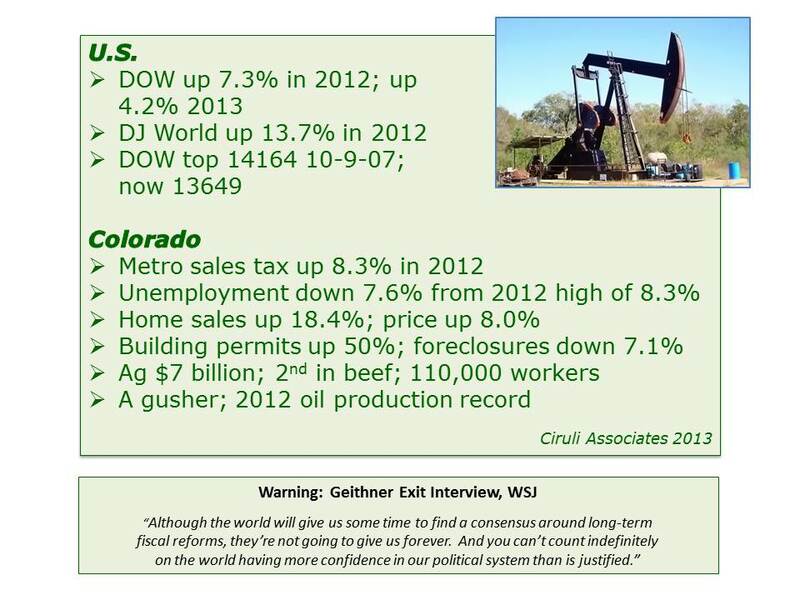 But, Colorado faces challenges. Some are perennials, like population growth, but others, such as the oil and gas boom, are new. Colorado citizens are fortunate. They live in a beautiful state with a strong and diverse economy and a better than average government. But, the task of 2013 will be to develop creative solutions to meet the challenges. Allison Sherry reported that Colorado Senators Mark Udall and Michael Bennet are struggling to deal with the new gun agenda promoted by the President and sponsored by numerous congresspersons, including Ed Perlmutter. They are avoiding early endorsement of proposals related to assault weapons and putting their emphasis on mental health funding and background checks. Majority Leader Harry Reid is worried about a host of swing state senators up in 2014 being forced to take positions on gun bills that have powerful and well-heeled constituencies in opposition and likely won’t pass the House. Although Senator Mark Udall starts in a strong position for re-election and has a generally centrist reputation, he would prefer to not have a host of votes on anti-gun legislation that may never get to the President’s desk. 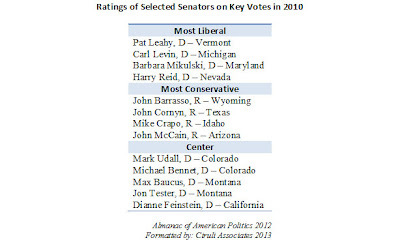 The voting ratings in the Almanac of American Politics shows the most liberal rated senators are from the Northeast and Midwest, with the exception of Reid. They are all Democrats. The West has many of the most conservative senators, mostly Republican. 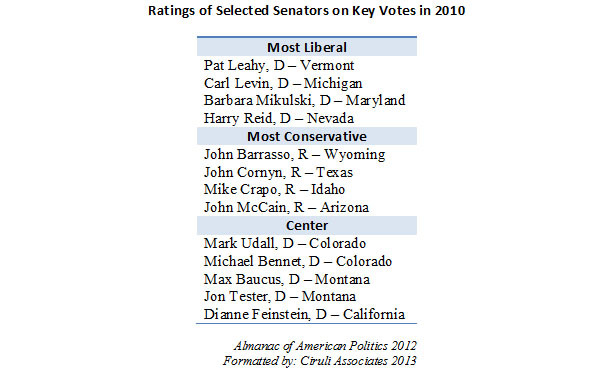 Udall’s and Michael Bennet’s voting records are in the centrist camp, along with Montana’s two senators. Dianne Feinstein of California is also rated a centrist, but is taking the lead on the assault weapons ban. Democrats must defend 20 seats, many in more conservative or battleground states, such as Mark Pryor in Arkansas, Mark Udall in Colorado, Mary Landrieu in Louisiana, Max Baucus in Montana, Tom Udall in New Mexico, Tim Johnson in South Dakota and Mark Warner in Virginia. Two Democratic seats are now open due to Jay Rockefeller in West Virginia and Tom Harkin in Iowa announcing their retirements in states that have elected Republicans statewide. Just when you thought the hydrocarbon sector of the economy was back, President Obama announces climate change is on the 2013 agenda in his inaugural address. House Democrats tried to mount a climate change offensive in 2009, but the bad economy and health care, financial regulations and other legislation consumed all the political space. The backlash on health care reform, evident by August 2009, brought new legislation mostly to a standstill. Recent polls show a majority of the public believe climate change is a serious problem (64%; very serious – 39%) (Pew, Oct. 2012). But, modest levels of agreement are registered on the question if it is manmade (42%). And, only 28 percent of seniors, a key bloc of voters in the 2014 House and Senate election, believe climate change is manmade and only 52 percent see it as a serious problem (29% very serious). The reality of 2013 is that oil and especially natural gas exploration, extraction, transportation, refinement and distribution may be one of our most important economic drives during the next phase of the slow recovery. It is leading American to a long sought after goal of energy independence. And, natural gas is, in fact, benefitting the environment by reducing the dependence on coal for electrical generation. Higher taxes and more regulations will likely face considerable opposition. If Hillary Clinton decides to run for president, as of today, she would clear the field. 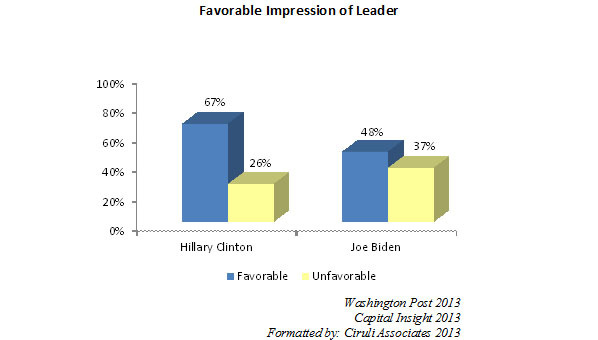 Joe Biden is trying to secure the second position against the field; i.e., Governors Cuomo and O’Malley, etc., but he is far behind Clinton. 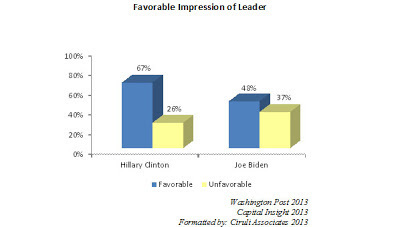 Biden’s high negative is no doubt related to his close association with the president and the polarization of Washington. One caveat, Clinton was the overwhelming frontrunner in 2007, and a little-known first-term U.S. Senator won the nomination. Much can happen in four years. 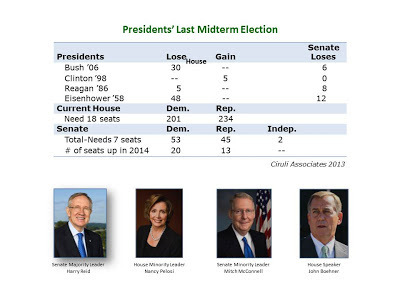 The usual rule is that the President’s party loses House seats during last midterm election. Nancy Pelosi and House Democrats want to beat the odds and win back the House. Bill Clinton was the only president in recent years to win House seats in his last midterm election. Democrats managed to do that in spite of (or possibly because of) the pending Monica Lewinsky impeachment proceeding. The main casualty of that election was Newt Gingrich, who surrendered his speakership. Democrats need 18 seats. Their strategy is to work with the newly energized President Obama to keep the Republicans on the defensive on a host of issues making them appear to be intransigent, outside the mainstream and captured by a radical right. One month into the new year, it appears to be working, but the election is still two years away and the odds remain long. President Obama begins his second term with a growing economy. That may be the reason it was barely mentioned in his inaugural address. Treasury Secretary Tim Geithner in a Wall Street Journal interview claims the U.S. economy is in its early fourth quarter of a recovery (Europe is only in its second quarter). He believes the economy is resilient and diverse with many strong elements in recovery. 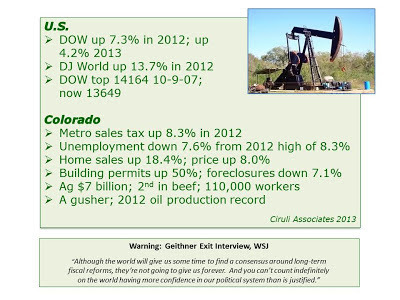 Colorado’s economy is definitely in a recovery. Its diverse economy is back in a host of areas: housing, agriculture, high tech, manufacturing and energy. Although Geithner believes the American economy is strong enough to survive the dysfunction of the political system, he does warn that, at some point, our creditors may run out of patience for our fiscal irresponsibility. The Udall cousins are in the news. Mark, Colorado’s senior senator, has announced his campaign. His cousin, Tom, senior senator from New Mexico, made a short list to replace Ken Salazar at the Interior Department. While he’s unlikely to go for the job, both cousins are up in 2014. As of today, both are expected to win. Barack Obama is a lucky man. He begins his second term with good omens, and he is not wasting time taking advantage of his good fortune. 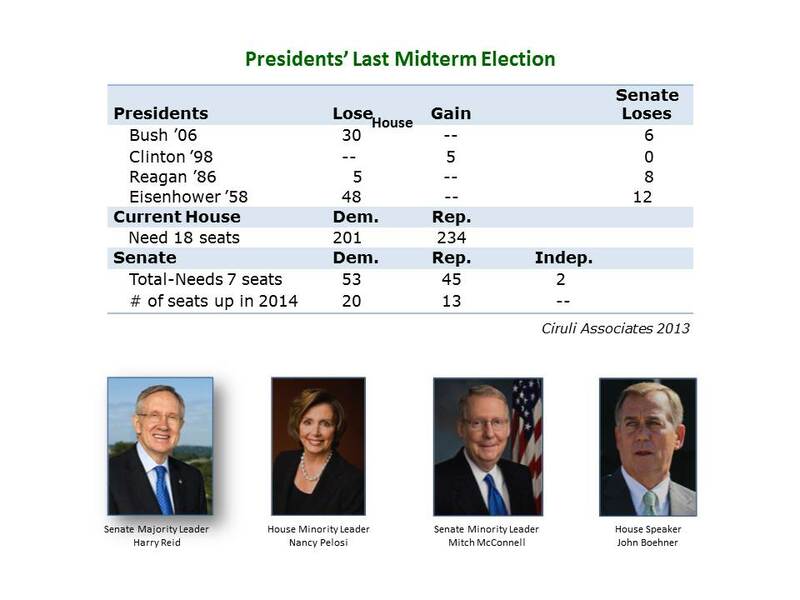 Although Obama was never behind in the hunt for electoral votes, Hurricane Sandy added several points at the end. And, after three years of an undetectable recovery, the last three months before the election saw upticks that weren’t missed, especially from a surging housing recovery. His approval ratings are back to the mid-50-percent range, not seen by him since his first year. A strong finish to a mean campaign propelled him into a successful New Year’s fiscal cliff confrontation with Republicans. Since the first of the year, he’s escalated the stand-down from Afghanistan, announced an aggressive agenda for gun control and is making immigration with a likely path to citizenship a second term priority. He’s also won the initial fight on the debt ceiling after basically one-press conference. However, Obama faces the so-called second-term curse where presidents from Truman to Bush tended to do much worse in terms of job approval. Obama’s predecessor dropped 25 points from his first to his second term. The only exceptions were Ronald Reagan and Bill Clinton, who in spite of serious crises that directly hit their respective White House’s on Iran-Contra and Monica Lewinsky, they ended their second terms more popular than their first. Obama may be helped during his second term by the fact that expectations for him are much muted from four years ago. A host of inaugural polls show the public less optimistic for his performance (drop from 66% in Jan. 2009 to 51% in 2013). Lower expectations may create a more realistic floor to lift off of and his aggressive couple of months since the election has already moved up the public’s perception of him as a strong leader. Good news for people in the prediction business. It’s almost impossible to be fired for getting it wrong. Karl Rove, who spent hundreds of millions of campaign dollars losing senate races and had a meltdown on Fox News on election night predicting a Romney victory in Ohio and elsewhere, has been rehired by Fox. Ken Salazar in 2004 basically launched the Democratic surge that has taken control of Colorado’s politics. As Salazar was defeating Pete Coors to shift the Ben Campbell seat to the Democrats, he set the tone and image of the Democratic Party for the next decade. George W. Bush was re-elected in Colorado by the same amount Ken Salazar won the senate (actually Ken received 997 more votes). In that year, Bill Owens (R) was governor, Wayne Allard (R) was the other senator and 5 of 7 congressional seats were in Republican hands. By 2008, Democrats took the governorship, the Allard senate seat and 4 of the 7 congressional seats. Although Republicans had a modest recovery in 2010, pitching up two congressional seats, they are still playing defense. In November, they were thoroughly whipped in the legislature and the presidency. Ken also gave Colorado Democrats a new congressman in 2004 – his brother John in the 3rd CD. In addition, Democrats began 2005 with control of both houses of the legislature, a feat not accomplished since the 1960s. “Ciruli said he didn’t think the tar of Washington — or any of the highs and lows at Interior between 2008 and 2012 — will cripple an ambitious 57-year-old Salazar if he wants to run for governor in six years. The 2012 election was bad for political science professors and economists who have an academic franchise in predicting presidential elections from unemployment and other economic data. Many predicted Mitt Romney and were wrong. In Colorado, CU professors Michael Berry and Kenneth Bickers used state-by-state personal income and employment figures among other variables to predict Barack Obama would win 218 Electoral College votes. He won 336. But, the professors weren’t alone in being off the mark. Romney, his team and a good number of pundits assumed the economy was the issue and Obama would lose. Although the economy was important, and Romney was judged better at managing it than Obama, for a number of reasons it wasn’t enough. Why economy didn’t win it for Romney? 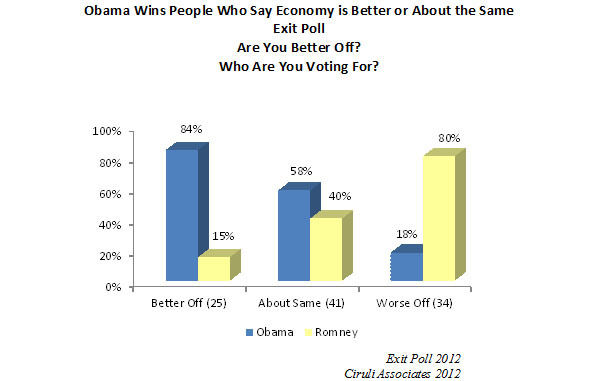 Barely Win It – The exit poll has the economy the number one issue with more than half the voters, but Romney’s advantage is only 4 points over Obama. Bush’s Fault – Fifty-three percent of voters blame Obama’s predecessor, President G.W. Bush, for the state of the economy, not Obama. Economy Improves – With a stroke of good fortune, the economy in August and September begins to improve enough the public begins to notice. Gallup poll shows that more voters believe they are better (38%) than worse off (34%). A year earlier, Gallup recorded only 29 percent said they were better off and 49 percent said worse. Job Approval – From a low of 43 percent approval a year ago, Obama wins on Election Day with 52 percent. He consistently won the empathy contest. People liked Obama more than Romney, and this presidential election was a choice between the two candidates – not just a referendum on the incumbent. Who says elections don’t make a difference? Immigration reform from college tuition to deportation to a path to citizenship has shifted from defensive and risky positions prior to Nov. 6 to top priorities with expansive approaches today. Majority Leader Harry Reid announces immigration is his top priority and a path to citizenship (i.e., able to vote) will be a part of the package. Republican Senator Marco Rubio is trying to help his party catch up and shift from defensive to offensive. Not easily given the Democrats see an advantage in advocating very aggressive positions. Colorado Democrats propose college tuition aid for undocumented students that is far more generous than a year ago when they were looking for compromise. Much of the newfound activity is a reflection of the power Hispanics and young voters demonstrated in the presidential election. But, the exit poll itself affirmed that voters were looking for a position of allowing immigrants to apply for legal status. Republicans; i.e., Romney voters, took the opposite position and opted for deportation. Washington gridlock is much a product of safe congressional seats. Colorado’s sixth congressional district was the only competitive race in 2012. The remaining six were won by the incumbent by 12 points or more. Although individual congresspersons may want to reach across the aisle, there is little local political incentive to compromise, given Colorado’s congressional election results. More Europe or Less Europe in 2013? Barack Obama survived his election, but bad economies have taken a toll on democratic leaders. Fifteen European leaders have lost their positions mostly due to the economy in the last two years. Does the political turmoil produce more Europe or less as a solution? The survivor among all the turmoil and failed careers is Angela Merkel, the chief crises manager of Europe. She has successfully maneuvered between need for Southern European bailouts and her domestic constituents’ frugal attitudes and their desire to protect their standard of living. Merkel’s lodestar appears to be for more, stronger Europe, even if in fits and starts. Possibly the biggest surprise of election night 2012 was the strong turnout of voters 29 years old and younger. Many, especially Republican strategists, expected them to vote at about their 2004 level, making up 17 percent or less of the electorate – but definitely less than the high of 18 percent turnout in 2008 when they mostly voted for Barack Obama. Instead, their 2012 share of the electorate went up to 19 percent nationally and 20 percent in Colorado (up from 14% in 2008). They voted for Obama by 60 percent, down slightly from 66 percent in 2008 according to the national exit poll. But, the 60 percent was more support than any other age group. Obviously, having a fifth of the electorate regularly voting 60 percent in favor of the Democratic presidential candidate is a major asset. But, possibly even more significant is the liberal views of the under 30 group that helped propel recreational marijuana legislation in Colorado, gay marriage in several eastern states and Governor Brown’s tax initiative in California. 73% favored Colorado Amendment 64 – legalize marijuana. It passed by 55%. 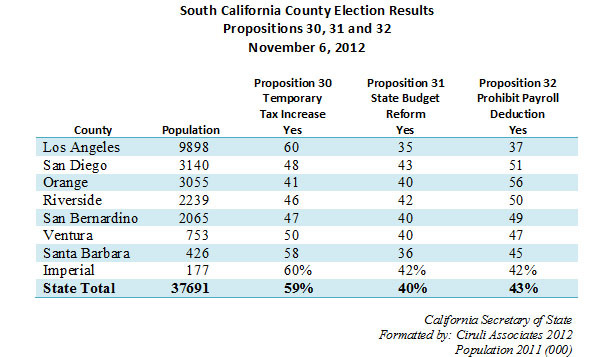 65% voted for California Proposition 30 – tax increase. It passed by 55%. This group has the power to reshape the political landscape if they maintain their political involvement. 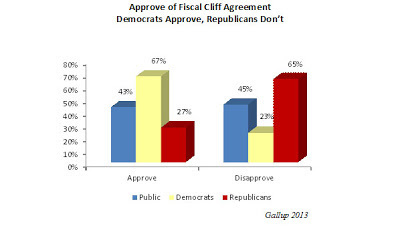 Although a new poll indicates that Americans believe President Obama won the fiscal cliff negotiations over congressional Republicans (57% to 20%), they only gave him a mediocre approval for his performance (46%) and they were decidedly mixed on the deal, with only 43 percent approving it and 45 percent disapproving. Democrats and Republicans were in sharp contrast in approval. Denver voters produced a larger margin of votes for Barack Obama than his statewide advantage. Denver gave Obama 148,907 votes, and he won the state by 137,850. That margin is why Mayor Hancock’s and Governor Hickenlooper’s endorsements are priority one for Democratic presidential candidates and statewide officeholders. Expect a parade to start showing up before the midterm elections. Should You Sell Your Glock Stock? After being stalled for many years, the Newtown, Connecticut school violence has apparently moved public opinion and cautious politicians to advocate more national (and local) gun restrictions. Although not uniformly. There are conservative parts of the country that believe the solution to acts of gun violence against civilians is a broader distribution of handguns and training. The constitutional principle of the right to own firearms does not appear to have lost much support. 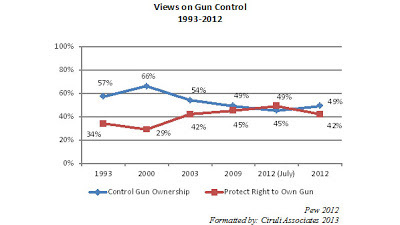 Since about 2009, gun rights and gun control have been closely divided viewpoints among Americans. But a significant portion of the public appears to believes Newtown reflects something is seriously wrong, not just an isolated incident by a mentally ill individual. Hence, a political or legal response is called for. Previous mass shootings of Virginia Tech, Gabby Gifford and the Aurora Theaters failed to produce calls for change. Gun ownership in a household is strongly associated with partisanship and where a person lives. Democrats’ challenge is that in rural areas, upwards of half of their partisans are gun households. Gun ownership has declined from about 50% of households to 35%. Most of that drop is among Democrats. Today, about 50% of Republicans own guns and 22% of Democrats. Public opinion polls are a worldwide phenomenon. There are some formal restrictions, some self-censorship and a broad range of quality. But, the views of citizens in all developed countries and many developing are being probed and reported by local commercial, non-profit, media and government organizations. Few countries report restrictions on question topics. Among large countries, only China and Egypt report legal restrictions on subject matter (most common, national security and religious or ethnic questions) in a new World Association for Public Opinion Research (WAPOR) study of public opinion activities around the world. A more common restriction relates to suppressing the publication of polling results prior to an election. Forty-six percent of the 85 national respondents reported some type of blackout of publishing polling results before an election. 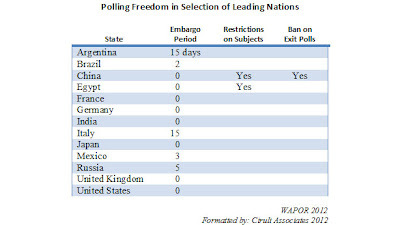 Among the larger countries listed below, Argentina and Italy use a 15-day embargo of results. Exit polls are banned by few countries, but many have restrictions, such as not being able to go into a polling place or not being conducted near a polling station. Only about 29 percent of countries reporting said exit polls had been conducted. Also, most exit polls are embargoed until all polling places are closed in the area. Nearly half (45%) of the polls conducted around the world are done in person, although most surveys in developed countries are conducted by telephone. Of course, world public opinion is regularly reported by Gallup, Pew and other international survey organizations. Harmony or Sovereignty in Asia? The four nations that dominate north Asian politics have new leadership, and three express stronger nationalistic agendas than their predecessors. For China and Japan, it may signal more confrontation; for the Koreans, it’s too early to tell the meaning – seven decades of stalemate makes predicting new overtures or directions risky. China and Japan have been testing each other in the disputed waters of the East China Sea, and each country’s new leaders are heirs of nationalistic leaders. They are emphasizing sovereign rights more than a mood of cooperation. Japan’s Shinzo Abe may be the most radically nationalistic leader in Japan’s modern history. And largely as a reaction to China’s new power and assertions of maritime sovereignty, he is advocating modifying the country’s pacifist clause in the constitution and a buildup of the defense force to project power rather than just defend the homeland. The latest Kim launched a missile to please the military and enhance the nation’s sense of worth. He gave a year-end speech that mostly repeated the usual statements of the struggle against foreign forces and the need to boost production. Ms. Park needed some liberal votes to win and appears to be more inclined toward overtures of cooperation than her predecessor. But both countries are now led by scions with conservative political bases and nationalist dispositions. 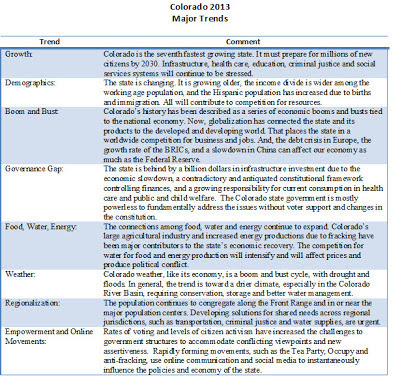 Colorado was front and center in the 2012 election. By late August, there were weekly candidate visits, and the first presidential debate changed the entire presidential narrative for a few weeks. 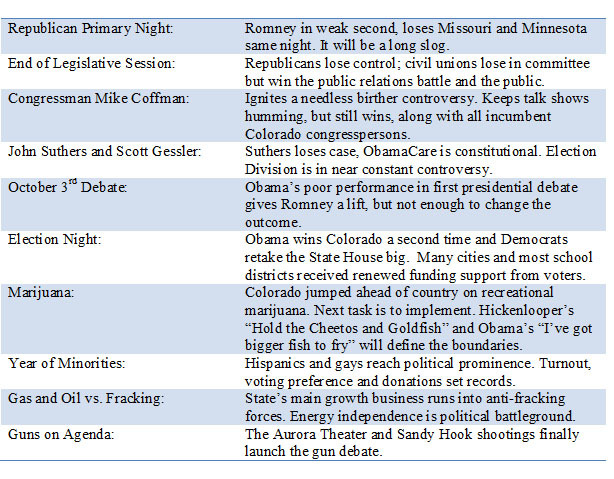 The following are ten of the biggest Colorado political stories last year. Along with the top political stories, weather and its impact affected our politics. A drought damaged the agricultural and ski industries and ignited a devastating wildfire season. Hurricane Sandy topped off an Obama lead. Californians may have missed the presidential race, but eleven ballot issues spent presidential-level campaign money. A total of more than $425 million was spent on the propositions, with $139 million, or a third of it, aimed at the defeated Proposition 31, a prohibition on employee payroll deductions. Labor and its allies spent more than corporate and business supporters by $13 million. 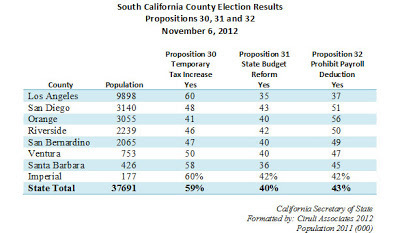 Most politically significant was Governor Brown’s successful temporary tax, Proposition 30, which seldom polled above 50 percent, but won an 11-point victory. The comfortable margin has provided Brown with an improved approval rating and political momentum. Proposition 30 was the other biggest election spender, with the Governor’s allies coming up with $67 million vs. $53 million opposed. Hispanic and young voters turning out and providing 20-point margins. Having the proposition linked to identified and immediate cuts in K-12 spending and increases in college tuition. Significant funding to conduct a strong campaign. Laying the groundwork with major cuts in government expenditures earlier in the year and a reform (albeit modest) of state and local pension obligations. Post-election polls describe the state’s voters, in general, as more upbeat and optimistic about 2013. Leaders interested in cleaning up state constitutions were not encouraged by the defeat of Proposition 31, an initiative promoted by a reform group of citizens supported by some of California’s leading foundations. Little was spent in favor ($4 million) and almost nothing against, but it had little chance with all the attention given to the Governor’s proposition and labor’s intense opposition to Proposition 31. The reform proposition was also described as complicated, lacking a statewide constituency and without a sense of urgency. Barack Obama, Time’s Person of the Year, is approaching his second inaugural address with an approval rating that he hasn’t seen since October 2009. It was the November 2009 Republican victories in the gubernatorial elections in Virginia and New Jersey that marked the end of Obama’s honeymoon from the heady days of his 69 percent approval at his first inauguration. Obama’s improvement in approval ratings since the election is not unusual. Historically, presidents add a few points of approval after re-election (2 points for Clinton in 1996 and 6 for Reagan in 1984). But a 6-point increase after the polarizing November election is impressive and no doubt reflects the President’s actions in the Newtown school shooting and their preference for his position in the fiscal cliff negotiations. It’s not clear the New Year’s negotiations will provide another boost. He ended 2012 at 53 percent approval. Equally impressive is Obama’s recovery from his weak start in the presidential election. He began 2012 with a 40 percent approval, near his all-time low of 38 percent approval on October 16th, 2011. That was one reason for Republican optimism that 2012 was going to be a good year. It was the failed debt ceiling negotiations in July 2011 that marked the decline of Obama’s approval rating from the 50 percent range to the low 40 percent range. Will the next crisis strengthen Obama or begin a decline? Although Americans remain resistant to more engagement in the Middle East, new polling shows President Obama has flexibility to fashion a more aggressive response to the Syrian civil war. In general, a majority (56%) of Americans see the Syrian chaos as detrimental to U.S. interests and the ability to fight terrorism. Use of chemical weapons can be considered the human rights exception to Americans’ overall support for the Obama administration’s reduction in military action in the region. There is strong support for the Iraq and Afghanistan withdrawals and 74 percent believe, in general, the U.S. “should not get involved” in Syria. Mayor Michael Hancock had a good year. He has installed a new administration with few mishaps. In particular, his new police chief has received mostly good reviews. The Denver Post seems satisfied. Most of their vitriol appears aimed at the Secretary of the State. Hancock’s most important achievement was to manage a solution to the city’s structural deficit, which he inherited and had been long studied. Voters gave his TABOR override a 73 percent “yes” vote. Although he is only halfway through his first term, at least one re-election appears secure. However, that doesn’t restrain speculating on the next mayor. Denver has had some exceptional mayors that have contributed to the city’s rise as the hub of a prosperous and viable region with a worldwide reputation. Will Denver’s next mayor be a woman?